RepSpark’s Customer Communication Hub can provide your apparel, footwear, or accessories business with intelligent, personalized communication campaigns using real CRM. Powered by a Real CRM (Customer Relationship Management) system, this convenient new tool uses real-time data to put the customer at the center of every interaction across your sales, service, marketing, and commerce channels. Find out how The Hub can help your business grow. Empower your team by providing them with 360-degree views of buyers and customer interactions, whether initiated by a representative, customer service agent, sales manager, or other team member. When the key to a successful campaign is getting the right message to the right customer at the right time, it’s crucial to send your buyers Intelligent Campaigns focused on what’s most important to them. Track Campaigns to Transactions to discover what’s working and what still needs work. By knowing where your opportunities for improvement are, you’ll consistently improve the customer journey for your buyers. Track Booking Status by Store to ensure accurate orders and sales forecasts. Find out how The Hub can help your business grow. Customer Centered Commerce - Real people expect real communications from real businesses. That’s where Real CRM comes in. To cut through the excessive “noise” of smart phones, social media, email, the Internet and TV, not to mention real life distractions, businesses need to send smart communications that provide relevant, timely messages to customers while also demonstrating a high level of personalization based on individual preferences. To accomplish this, team members must have access to an accurate history, buying patterns, and a 360-degree view of conversations for each account. RepSpark already provides customizable line sheets that allow you to add account logos, colors, and more. The new Hub takes it one step further by empowering brands to send targeted communications to a single account or a group of accounts with similar buying patterns or locations—customer personalization at its finest. The Hub - The key to effective personalization is knowing your customers. Customer service informs a rep that they spoke with an account. Accounting alerts sales that an account has been placed on a credit hold. A manager asks a rep to visit an account. A rep advises marketing that an account wants a specific POP. To penetrate the market and provide intelligence along the buying chain, your team needs a 360-degree view of each account. Intelligent Campaigns – Engage customers across multiple channels. With intelligent campaigns, businesses may quickly create, distribute, and transact upon geographical promotions, top selling products, and perfect buys. This enables brands to help retailers visually understand which items are selling well in their area and which items they should add to their product mix based on purchase history. The buyer then clicks the campaign link to open a shopping cart pre-filled with your customized products recommendations—all they need to do is enter their desired quantity. It’s that simple! Detailed analytics provide insights into who purchased what from each campaign and who needs a follow-up. When it’s time to make your initial cut/production order, will you be confident in your forecast styles based on prebook orders? Do you feel comfortable with your sales plan when you have only received 50% of your orders? Have your top accounts completed their preseason ordering? Is the rep sitting on a $15,000 order? 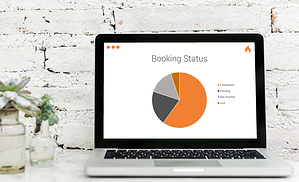 Wouldn’t it be nice if you could easily scan a booking status report to see where each rep was? Well, now you can. The Hub gives you visibility into every customer communication, so you know exactly what’s happening with each account. If you’re ready to start, we’d love to chat.